Porsche ran one of its last-of-the-oddballs Indy racers at Rennsport Reunion this past weekend, briefly letting the turbo V8 sing in its 1990 March chassis. What I find particularly charming is how the team pulled some data from the car. I won’t go into too much depth on Porsche’s failed Indy program, a campaign that was originally going to be in an all-carbon car until American officials outlawed it and forced the team to run a standard aluminum chassis, spooked that Porsche would show up and dominate and ultimately destroy the series. Porsche had done it to Can Am, don’t forget. Teo Fabi in his sadly-aluminum car at the 1990 Indy 500. Again, I don’t want to go too into the weeds also because 8W has an incredible and massively in-depth history of the program that you should block out an evening to read. Why is McLaren spending thousands of pounds on a specific version of the LTE 5280 laptop, a piece of ancient history you could otherwise grab on eBay for a few hundred bucks? So next time you go to a vintage racing event, keep an eye out. 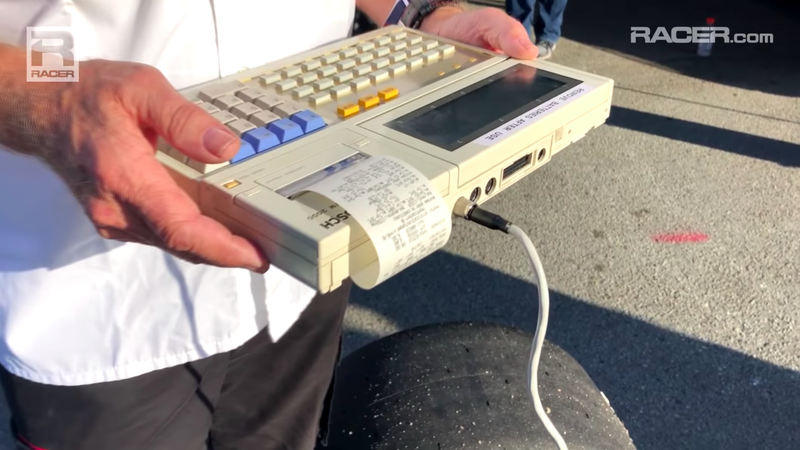 You’ll probably spot some period-correct computing around some of these early-digital cars, done out of necessity and not just to look cool.